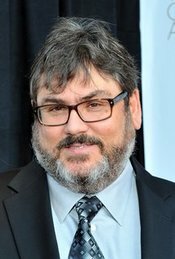 Paul Dini was born on August 7, 1957 in New York City, New York, USA. He is known for his work on Batman Beyond: Return of the Joker (2000), Superman (1996) and Batman: Arkham City (2011). Wrote the "Mad Love" story with Bruce Timm which was later featured in The New Batman Adventures (1997) TV series (1997-1999).Perhaps famously known for creating the DC comics character, "Dr. Harleen Frances Quinzel" aka Harley Quinn, for his friend, Arleen Sorkin. She made her first appearance in Batman: The Animated Series (1992) and was popular enough to be eventually inducted into the DC universe comic books in 1999.